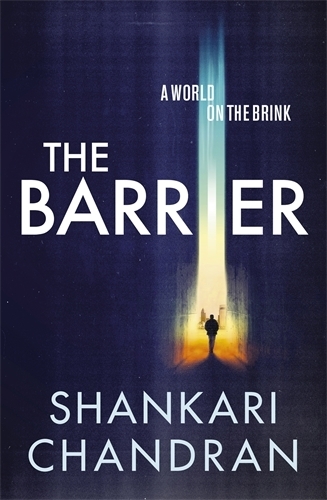 The Barrier is a science fiction thriller set in the year 2040. The world is divided into the Eastern and Western Alliance after World War Righteous (“WWR” – 2020 to 2025), a devastating religious war that also allowed Ebola to sweep the world. After the Armistice Accord is signed on 9 June 2025, two mechanisms are put in place to prevent a repetition of WWR – the Immunity Shield, a global vaccination program administered freely by the World Health Organisation and controlled by the Department for Biological Integrity (“Bio”), and the Information Shield, ensuring that only approved information can flow between the two Alliances. So, when evidence comes to light of a “fake” vaccine – one that mimics the real one (EBL-47) but has no protection against Ebola and doesn’t contain the Faith Inhibitor, Bio calls in Agent Noah Williams, the conflicted hero of the story. Their main suspect, virologist Dr Amir Khan, is in Sri Lanka, in the Eastern Alliance. Bio needs a cover story to send Noah and his team in – and so they engineer an outbreak of a new strain of Ebola in Colombo General Hospital. Shockingly, the victims are only babies, injected with the virus by Bio’s agent in Sri Lanka, Sahara. Noah, together with his team, Agents Garner and Crawford, pose as WHO delegates investigating the new outbreak. This gives Noah a reason to work closely with Dr Khan, who, in turn, is trying to work out how the virus got into the hospital in the first place. Despite himself, Noah forms a bond with Khan – they have both lost people they loved and Khan becomes somewhat of a father figure to Noah. There are villains on both sides of the Barrier – and sometimes it’s pretty hard to know who the “good guys” are. Noah himself has done some terrible things, under orders, but as the story progresses, he begins to question his own beliefs and the part he plays in Bio’s work. Noah and his team find themselves in danger more than once, and not everybody gets out alive. This book was quite different to the genres I usually read – but I found it intriguing and very believable (in a scary way)! It took me a little while to get into it, but once I did, I found myself wanting to see what happened next. Noah is a complex character and his growth through the story is engaging and interesting, giving the book its heart. There’s lots of action, interesting subplots, and, although it’s quite a bleak story, the ending is hopeful. Overall, it’s a really good read that keeps you guessing until the end.